This is the memo sent to all Council, after I asked Administration about Radon gas last month. 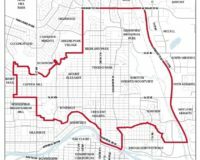 I heard from Ward 4 residents about this issue, and glad there is some information that I can pass onto you. This memo has been prepared in response to the question from Councillor Chu regarding radon gas during Question Period at the Regular Council Meeting on 2017 February 27, and to recent media attention on radon. Health Canada recognizes that radon gas exposure is a health matter, and a guideline for radon exposure inside a home was established in 1988. In 2007, the guidelines for acceptable levels of radon in a house were lowered from 800 to 200 Bq/m³ as a result of updated scientific research. For radon gas to be considered a concern and an emergency, it requires extended concentrated exposure in an enclosed space. Once the gas is vented to the open atmosphere it dissipates quickly and there is very little risk of it being sucked into another opening, such as a window or another vent. The City applies the same venting standards to radon as it does with venting carbon monoxide from heating and plumbing systems. The majority of Canadians (93%) and Calgarians (88% – 92%) live in homes that fall within Health Canada’s guidelines. As research, learnings, and awareness continues to advance, legislation was added to the 2014 version of the Alberta Building Code (ABC) requiring all new builds and renovations (starting 2015 November) to include radon mitigation rough-ins for future mitigation, should it be required. The City sits on numerous Provincial and National Building Code Committees, and will ensure that radon is given appropriate consideration by code-writing authorities. Information on associated health risks and options for testing can be found on Health Canada and Alberta Health websites, and the “Take Action on Radon” national campaign website. The City’s website provides information on building requirements related to radon. For more information on the ABC about radon, or technical questions about roughing-in a radon mitigation system, citizens can visit calgary.ca/radon, or contact 311 and ask to speak directly to a safety codes officer. The information in Attachment 1 will also be made available to the public via the City blog, social media, etc. Radon is a radioactive gas that occurs naturally when the uranium in soil and rock breaks down. 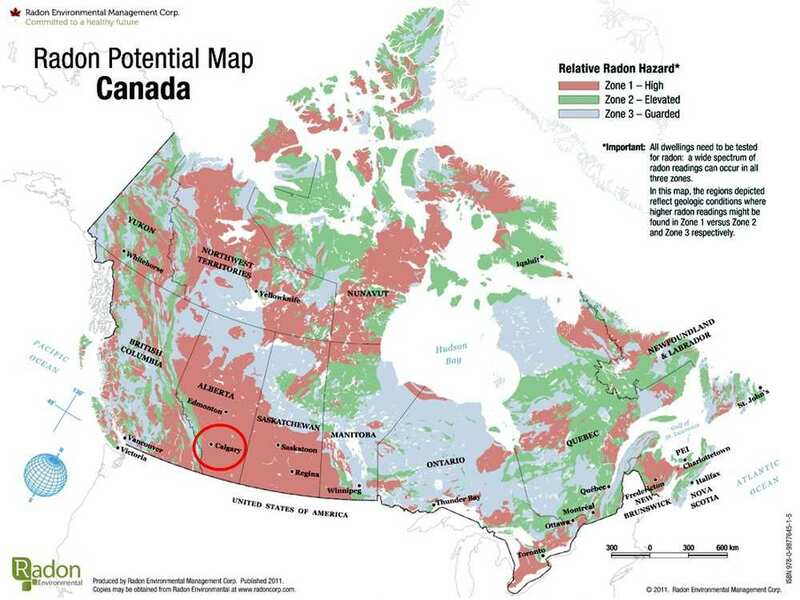 Naturally occurring radon can be found in varying levels across most of Canada. Radon gas is invisible, odourless and tasteless. When radon is released from the ground into the outdoor air it is diluted and does not pose a health risk. However, when concentrated in an enclosed space, it has been linked to an increased risk of developing lung cancer. The risk of cancer depends on the level of radon and how long a person is exposed to those levels. Health Canada has had a radon guideline since 1988. In June 2007, the guidelines for acceptable levels of radon in a house were lowered from 800 to 200 Bq/m³ as a result of updated scientific research. Based on a two year Health Canada Cross-Canada Survey of Radon Concentration in Homes, the final report from March 2012 shows that of the 86 homes surveyed in the Calgary Health Region, approximately 8% exceeded the 200 Bq/m3 guideline. 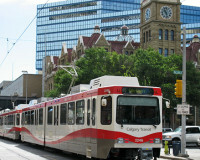 The recent study reported by the University of Calgary indicates that approximately 12% of houses they monitored in Calgary exceeded this limit. Nationally it is estimated that about 7% of Canadians are living in homes with radon concentrations above the guideline. The provinces where radon was found to be most prevalent in homes were Manitoba, New Brunswick, and the Yukon Territory where it was estimated that approximately 20% of the population lives in homes with radon concentrations exceeding the guidelines. Additional information on radon, associated health risks, and options for testing can be found on Health Canada and Alberta Health websites, and Health Canada conducts public awareness campaigns. Radon is not monitored by CEMA or Fire as it is only harmful after extended periods of time, and is not an emergency concern. 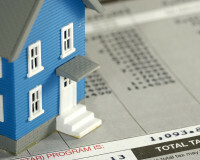 The only way to know if you have a radon problem is to test your home. Health Canada recommends that all homes be tested for radon levels. To test for radon, one can purchase a do-it-yourself radon test kit or hire a radon measurement professional. Radon testing takes 90 days to complete and Health Canada recommends testing during the winter months when windows and doors typically remain closed. There are no requirements for homeowners or developers to test for radon. Testing is at their discretion, as is installing a venting system if the radon levels are found to be high. All new construction by The City includes gas mitigation measures. If radon gas is detected through geotechnical testing, radon mitigation is undertaken. The City is reviewing the need for a radon testing strategy for City facilities. The 2014 version of the Alberta Building Code includes requirements for the rough-in of a radon mitigation system that allows for the future control of radon gas should high levels be detected in the home. Requirements include the provision of a gas permeable layer between the basement floor slab and the soil beneath the slab. This allows gas to flow to the gas extraction point. A pipe that serves as a radon collector is to be provided from the extraction point on the underside of the floor slab to above the slab and then capped off. All penetrations in the floor slab and joints between the foundation wall and the slab are to be sealed against radon infiltration. If a homeowners’ radon testing shows high levels, they can then simply remove the vent cap, add a fan, and piping that leads to the exterior. All new builds and all renovations requiring a permit must rough-in a radon mitigation system. The City ensures that these requirements are fulfilled when we review building permits. All City safety codes officers are trained on what to look for, both at plans examination and during building inspections. We also provide information on these requirements on our website. We do not require a permit or follow up on the installation of a radon extraction system. While some jurisdictions require rooftop release of vented radon, in northern climates such as Calgary, there is a risk in the winter months of attic air freezing the pipes and having radon return into the house. Therefore, it is recommended for buildings to vent out the side of the building. Once the gas is vented to the open atmosphere it dissipates quickly and there is very little risk of it being sucked into another opening such as a window or another vent, unless those openings are very close to the termination. The City applies the same venting standards to radon as it does with venting carbon monoxide from heating and plumbing systems. 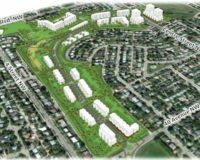 The City participates on the Building Sub-council of the Safety Codes Council, and has recommended that Alberta Municipal Affairs provide a Stan data regarding vent terminations of gas appliances that also includes clarification of the locations and methods of terminating radon gas control vents. The City also sits on committees responsible for the development of the National Building Code, and will ensure that the latest radon safety issues are given appropriate consideration by the code-writing authorities. For more information on the Alberta Building Code’s radon requirements, or technical questions about roughing-in a radon mitigation system, citizens can contact 311 and ask to speak directly to a safety codes officer, or submit an online inquiry.